Tomodachi in the Japanese language translates to “friends” and literally means “those who go with.” Montana artist, George McCauley, has organized a cultural exchange, consisting of two separate but connected exhibitions that started with a residency and exhibit in Japan in October of 2014. The culmination of these two residencies will come to a close at the Red Lodge Clay Center with Tomodachi Too. Joined by his friends and colleagues, David Hiltner and Koichi Yamamoto, the artworks presented in Tomodachi Too are the result of three artists working completely different in their approach to clay, but creating in the same locations; this exhibition includes artworks created in Japan as well as the Red Lodge Clay Center. Each artist has a unique approach to clay, and share the same passion of working with clay as the material of choice. Also on view at the Holter Museum in Helena, Montana is a complementary exhibition that continues to explore the dynamics of these three artists. George McCauley describes his artwork as, “casual and flawed.” Not working with precious hands, George thinks about every action that happens when his hands meet the clay. Rather than erase the flaws that occur when moving a pot or making a mark, he embraces these moments as a design element. This visual evidence becomes some of the most important aspects of his artwork, complimenting the intuitive, on the go decision-making that makes his beautifully flawed artwork consistent and precise in its own way. Born and raised in Kansas, David Hiltner examines his past environment of the Midwest landscape as the influential starting point for his artwork. Silos and endless fields of crops dominate the vast landscape of his past. The carving patterns he incorporates into his forms are reminiscent of the rows in the fields during planting season, curving around the pots and utilizing the entire surface. His atmospheric firing in wood and soda kilns leaves evidence of the traveled flame in all areas of his pottery and sculpture. As an avid fisherman, David’s love for the hunt has resulted in new trophy forms, placing emphasis on the act of fishing and the rewards that follow. 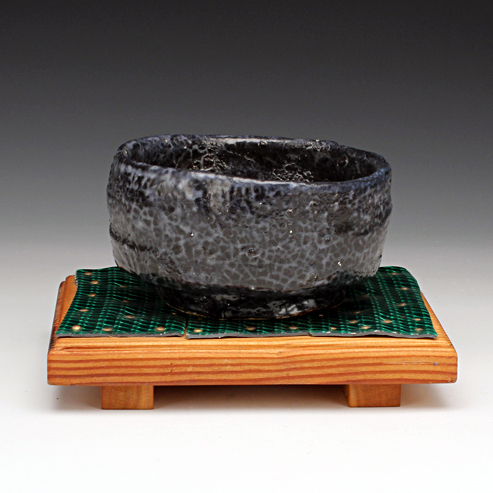 Currently from Kumamoto, Japan, Koichi Yamamoto has a strong background in the traditions of Japanese style tableware. Teapots, teabowls, and suiteki bottles are common forms that continually influence him. His artwork has a quiet sensibility within the forms as Koichi carefully disrupts the surface with delicate mark making. These marks and impressions in their softness compliment the form and allow the firing process to embellish and enhance the marks left by him. The sculptures are a nice contrast to the pottery, reflecting both a visual and physical weight that balances out the softness of his pottery.